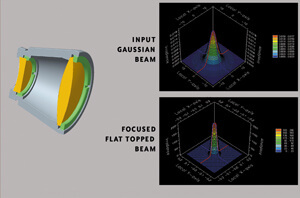 II-VI designs a simple form lens to convert a Gaussian mode to a flat-top intensity profile. Converting one beam mode to another type is always a difficult process. There are different products to address this problem, including diffractive lenses, special beam integrators, combinations of aspheric lenses, and phase plates. As with many design types, it’s desirable to use the simplest form. The II-VI aspheric form is one of the simplest types. The method used to convert a Gaussian beam to a flat-top at focus is determined somewhat by the required focused beam size. A faceted beam integrator is necessary for large spot sizes (see above). However, when it’s necessary to focus a laser beam to a flat-top intensity with a spot size of 100µm, it’s also necessary to go to more sophisticated aspherics or diffractives. II-VI accomplishes this with a simple aspheric form. Depending on focal length, this lens is produced as a singlet or doublet. Focal lengths from 25 mm and up. Unit may consist of one or two lenses, depending on desired spot size. Requires Gaussian input beams with M2 values < 1.1 for best results. Applications for drilling and materials processing.